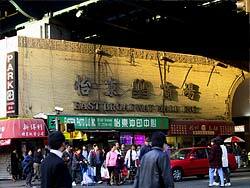 East Broadway is sometimes called "Little Fuzhou" because of the recent influx of so many Chinese immigrants--legal and illegal--most of whom are from Fuzhou, China. 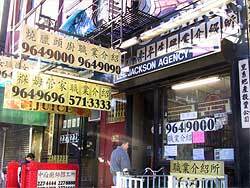 With this new wave in immigration, the social, political, and economic fabric of Chinatown gets flipped around leaving some hopeful as they gain more influence, and others resentful as they lose. Competition for limited government dollars and resources leave many wounded (hurt feelings) as people begin blaming others for slowly rising crime rates, and questionable political allegiances. 08 Dec 2007. Mini-mallification of East Broadway. 23 Feb 2002. East Broadway between Market and Catherine. An employment agency. 23 Feb 2002. 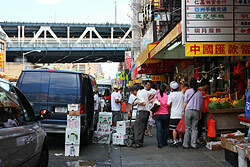 The cavernous mall under the Manhattan Bridge. 16 Feb 2002 Chatham Square Library. This library opened 1903. The elegance of this building is really quite understated. The building was designed by McKim, Mead, and White combining Classical, and Renaissance Revival features for a distinctive style later replicated in many library buildings built with funds from Carnegie's endowment to the New York Public Library in 1901. The library itself was recently renovated, and upgraded in 2001, and received landmark status. Sometimes when a building gets torn down to build something new, or even if a big storm passes through and rips up an awning, you sometimes catch a glimpse of the past.... 12 March 2008. 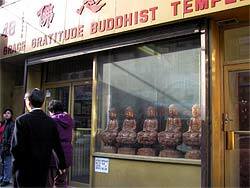 Grace Gratitude Buddhist Temple, 48 East Broadway. 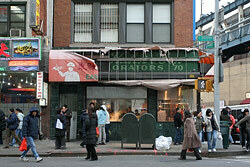 They were rocking the storefront buddhist temple look in 2002, but decided to remodel in 2007. Mesivtha Tifereth Jerusalem, the oldest Yeshiva in America, established 1907. 145-147 East Broadway. I thought the Moorish style arches reminded me of umbrellas. 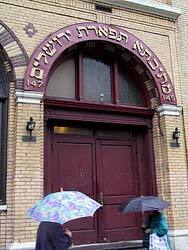 Umbrellas shelters one from the rain, just as the Yeshiva (arch) helps shelters and cultivate the mind. 18 June 2006. 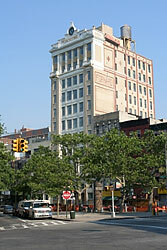 The old Jewish Forward Building, 173-175 East Broadway. Built in 1912 for the headquarters of the leading working class newspaper of its day, the building was sold in 1974 and became a church and Chinese bible factory. In 1999, the building was converted into condominiums. Finished renovations to the facade was completed in 2006. 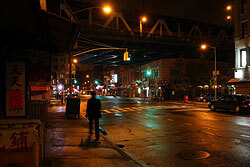 06 June 2009 at night. · Publicly accessible libraries with large Chinese collections include the main New York Public Library at 5th Ave, 41st St. (research materials). 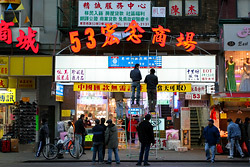 · Donnell Library at 53rd Street (over 13,000 Chinese language titles, mostly popular works). 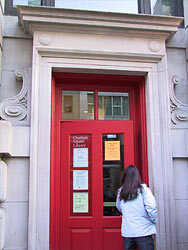 · CICC Library at 1230 6th Ave. (for extensive Chinese language materials relating to Taiwan). · The main Queens Library in Flushing (for extensive Chinese language popular works, and reference materials). · The main Brooklyn Public Library at Army Plaza (for a growing collection). · Brief history of the Jewish Forward building "A Capitalist Venture With a Socialist Base" Christopher Gray, New York Times, July 19, 1998.